John Malkovich is a government agent, George Clooney is some Finance Department administrator with a gun. Frances McDormand is working in a fitness club, where Brad Pitt works out day and night, but just his arms, never his brains. Clooney screws Malkovich’s wife, Malkovich gets fired, Clooney shoots Pitt in the face, McDormand tries to sell Malkovich’s laundry list to the Russians, Juno’s father is running the CIA and is trying figure out when exactly did the world around him go loopy (“Is that all now?” – “There’s one more thing…”). Then the film is over. The Coen brothers may be responsible for some of the funniest moments I have experienced in cinema, in particular “Raising Arizona” and some bits from “The Big Lebowski” involving John Torturro stand out. The last 5 years of comedy, however, was a letdown. I could not bring myself to watch “Intolerable Cruelty”, and when I dared watching their remake of “Ladykillers” I almost lost faith. These days, their comedy is much more funny when injected through the syringe of drama, as “No Country” showed, but also “Fargo” had proven earlier. 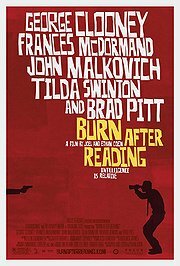 Plain comedic adventures by the Coens, I have now confirmed after watching “Burn after Reading” are not my piece of cake, to say the least. While there are funny moments (the scenes in the CIA headquarters with JK Simmons getting almost emotional about all these pillars of secret service crumbling around him; and – yes! – the moment that marks the death of the Brad Pitt character caused everybody in the room to laugh out loud), but there is little humour and certainly there is very little fun beyond some screwball moments. In the words of Dr Kermode: That’s alright if they a “Burn after Reading” to clean their systems and be able to make another “No country for old men”. And then the update 2013: How come that China Eastern Airlines had exactly one film worth watching among their 100 inflight entertainment choices, and that was “Burn After Reading”? Strange, but hey, have not seen it in years, and the only thing I remembered was that I laughed heartily upon the premature demise of Brad Pitt. Having seen Brad Pitt just a day ago trying to be all superhero and brave and cool, it was refreshing to see him here in his different self: wearing shorts, trying to find Gatorade, trying to make conspiratorial phone calls, trying to sneak into a spy’s house… I just realise that the guy is a failure in everything but getting himself killed in a hilarious way (oh yes: spoiler alert… hey, that film is from 2008! And it IS funny). Thanks to the Coen boys for entertaining me with this. In exchange, I withdraw my rather cool 2008 initial reception of the film and say: funny! Man I completely forgot about this film, thanks for reminding me about it and for the fact that I still need to get my hands on it!